Alex Smith investigates the big sister to Windy’s famous 31 Zonda. While almost any showroom powerboat has the ability to ignite your imagination, the presentation of the Windy 39 Camira at the Dusseldorf Boat Show made a particularly diverting spectacle (watch the Windy 39 Camira First Look Video from the show). Set amongst a maze of pale, crystalline light beams that sparkled on the long contours of its slender hull, it possessed a quiet bravado that won it prominence, even among the exalted company of the Scandinavian hall. It was exactly the kind of exhibit that made you stop for a concerted think about how it might feel to get behind the wheel - and with a hull from the much vaunted Hans Jorgen Johnsen, exterior styling from superyacht specialist Dubois, and interior layouts from Design Unlimited, the answer to that question is likely to be every bit as gratifying as the Camira’s attractively pared back form. The pared back Windy 39 Camira is more a driver's boat than a people mover. Until now, we’ve only seen the Camira equipped with the ‘Sports’ layout in the cockpit. That uses quite an open deck, with a stove behind the helm seat, a sink behind the co-pilot position and a U-shaped dining section with sliding seats, orbited by unbroken walkways in the centre of the deck. At the aft end, the classic Windy bench and sunpad then allows you to use the sliding backrest to expand the open lounging area. Here, however, the more conventional Sun Lounge layout is likely to find even wider appeal, particularly in the UK. It basically alters the central part of the cockpit (between the sunpad and the helm seats) by replacing the open deck and U-shaped diner with a galley unit to port and an unbroken C-shaped seating section with large rectangular table to starboard. This substantially increases the seating capacity but it does so without inhibiting the freedom of passengers to make their way up and down the walkway between the aft bench and the helm-mounted steps to the foredeck. The Sun Lounge cockpit option provides extra seating without inhibiting movement. With no hardtop or arch overhead, the 39 continues to feel like a very open boat and yet the new generation canopy also makes it impressively adaptable - not just for all-over cockpit cover during periods of rain but also for partial shade from the intense summer sun. The canvas comes ready-mounted on a frame that simply lifts from its recess beneath the aft seat, before pulling taut on self-tensioning stanchions. That makes it very rapid to erect as well as easy to stow, which is ideal for a cockpit-intensive craft like this. Back aft, the tender garage with its electrically operated rams is capable of swallowing a fully inflated two-metre boat – and there is also a very neat basket for four fenders hidden below the walkway to the side of the sun pad. However, arguably the most pleasing feature here is the walk-in machinery room with its ladder access via a hatch beneath the aft part of the cockpit sole. With everything sensibly installed, neatly routed and properly labeled, plus a refreshing degree of access to everything that matters, it is as well arranged and rigorously appointed a space as any I’ve seen since leaving the Royal Navy. The established formula means you are always going to get some form of overnight accommodation on board a Windy, but the Camira 39 is much better thought of as an authentic open sports boat than a simple sports cruiser. After all, the longstanding 40 Maestro already caters for the needs of the family boater in search of comfortable cruising. 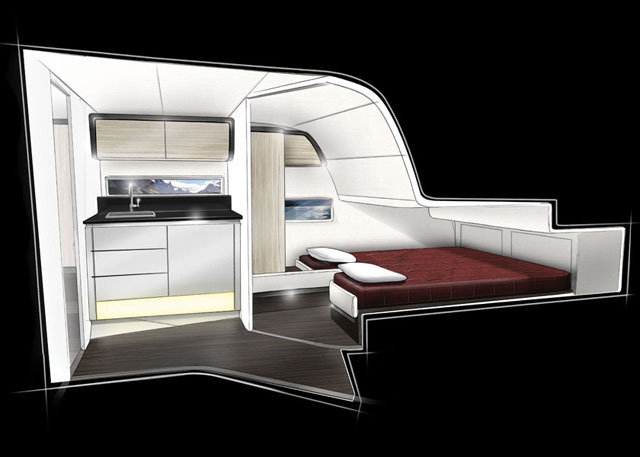 So instead of treading on the Maestro’s toes, the 39 Camira is designed to operate as the big sister to the dynamic, single-cabin 31 Zonda, offering a real taste of that same thrilling helm experience alongside the added bonus of a second bed. While six-foot headroom is modest, the port heads compartment is impressively spacious. Down below, therefore, headroom of about six feet is not especially generous – and those familiar with Windy’s performance-driven designs wouldn’t expect it to be. Certainly, the main body of the cockpit gets away without feeling unduly constrained, but Windy’s laudable crusade to mitigate windage as well as impacts on its high-performance models means that, with a narrowing beam and an acutely angled hull, the internal space in that tapering bow is always likely to be modest. However, in classic Windy style, it is also impressively clean and modern down here, with a vast acreage of Alcantara (a tactile and very practical suede-like fabric) allied to pale, soft-toned woods and very confident, uncluttered lines. In the companionway, which doubles as a compact galley space, you get a small sink and microwave to starboard, plus a couple of fridges, all neatly integrated into the trim. You also get that crucial guest cabin beneath the cockpit sole to supplement the master suite in the V of the bow, plus a surprisingly spacious heads compartment to port and plenty of hard-working storage solutions throughout. Of course, there’s no stove down here, but in terms of light, ventilation, space and convenience, it’s entirely right that it should find a permanent place upstairs instead, alongside the diners in the open cockpit. 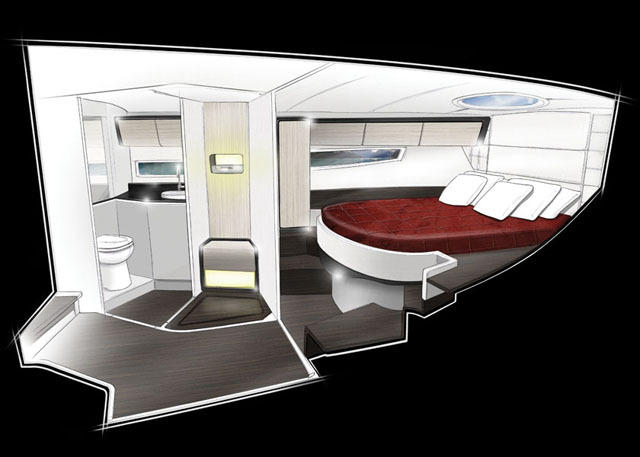 The second cabin gives Zonda fans something to aspire to. 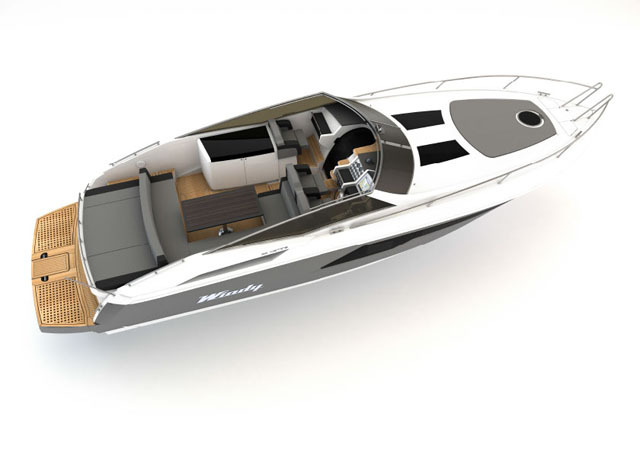 For more high-performance sports cruisers on boats.com, see our Fjord Open 48 video or news of the upcoming launch of the Frauscher 747 Mirage Air.